The Sprint market is also up for 2012. Good cars are more expensive than last year -the top cars are very expensive. Cheap ones don’t seem to have moved much though. Market 375 was a $2500 Sprint shell with rust. I suppose it sold since I haven’t seen it making the rounds. Market 322 was Sprint 750B 08650, just the body selling for $3800. 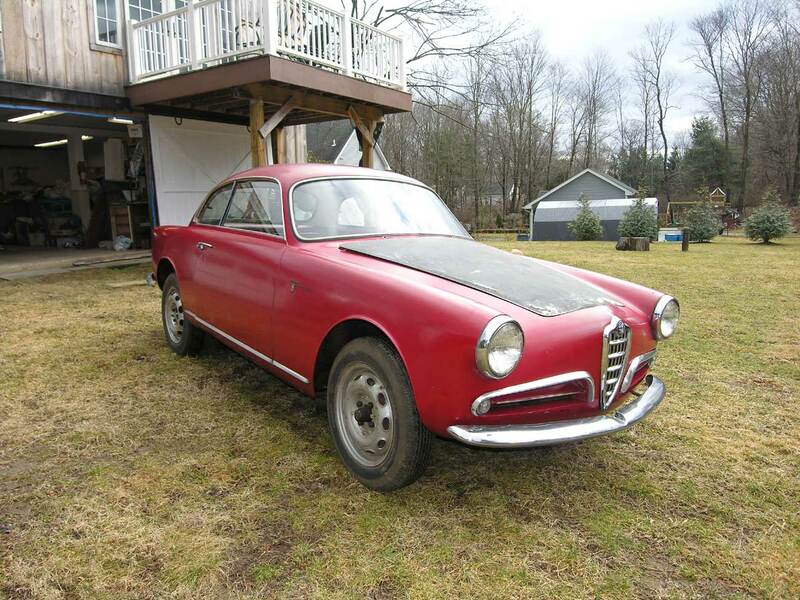 Market 387 was Giulia Sprint 10112*356053, selling for $8150. Update 5/30/12: Sold for 414,400 Euro’s, about $546,000! 2/13/12: Giulietta Sprint Veloce ‘Zagato’ 750E 1493*06184, 1315*30851. This very interesting SVZ is going to be auctioned by RM in Monaco soon. While most cars I write about are straight forward subjects, and anything I say should be taken as insightful mainly due to heavy exposure to the subject if nothing else, and as being typically off the cuff. A car like this demands careful consideration and wording. Why? The genuine article -a Zagato re-bodied Sprint Veloce, that was re-bodied ‘back in the day’ i.e. the late 1950’s, is a very valuable car. See this thread on the AlfaBB for some lengthy but enjoyable reading on the subject. Interestingly, this car is listed as MIA since 1960. It’s important to note that there was no search party out looking for it -it just stayed under the radar since then. So, with a spirit of caution, I start, and will reserve my comments to ‘ooh’s and ahh’s’ once more. That is one desire-able object! Note squared off wheel openings. Hood is a low as they could practically make it and still fit the engine. Color scheme is bold -red headlining is fantastic. Any significance to that license plate number? Wheels look to be period cast wheels -magnesium? This is pretty close to the top of the Giulietta food-chain. 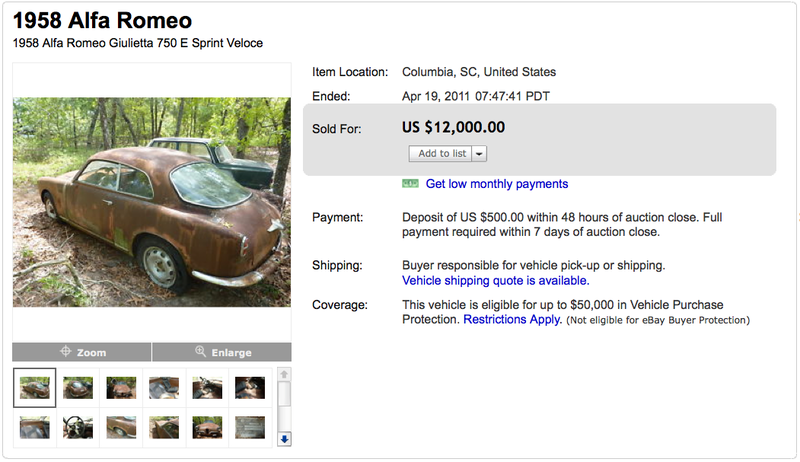 Update 1/15/12: This car has been loosely assembled, had new pictures taken and relisted on eBay. Seller says to call them (Daniel, 203 778 2601), that they expect to have a strong offer for it and sell it before auctions end. I hope it finished at auction so we get a sense of what a car like this is really worth. Looks like a car now. I know it needs as much work as one all apart to restore this, but I would make it run and drive with the minimum effort first, enjoy it on the road for a few years then do a gradual nut and bolt. Too bad I don’t have a billionaire benefactor in my readership. A wonderful book about the restoration of it could be produced. I am assuming this is all just finger tightly assembled, but at least you can see it’s all there. -except the hood latch. Would the hood have been stamped with the body number? Laurence’s SVC has this color scheme interior, in original condition. This would look amazing if just carefully put together with what you see. Horn ring is busted. 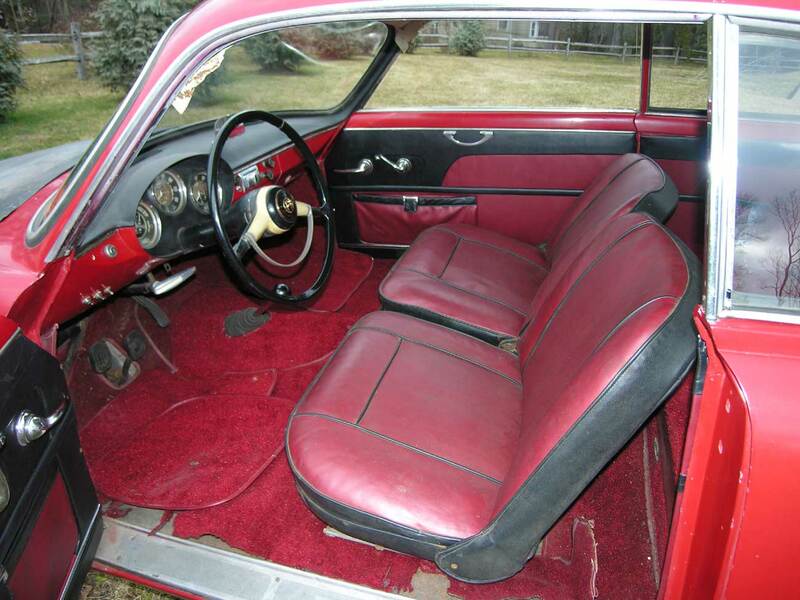 Giulietta Sprint Veloce ‘Confortevole’ 750E 1493*06600, 1315*31079. This very complete and very rough and one of about 200 so very rare SVC was on eBay for all of about 2 hours before being purchased, Buy it Now for $12,000. Seller listed the car in Columbia, SC. Thanks Corey for pointing it out! Pulled from what would have been a leafy death just in the nick of time. Headlights look like original Carello units. Hood fits great. Door hinges work. No evidence of rubbing noses with anyone too aggressively. Hints of bluette paint? A winner! Yep -$12,000 smackeroo’s. A good deal? I’m going to say yes, would have been a solid deal at the $20,000+ it would have made if it had sold through the usual 7 day auction. One of these cars hasn’t changed hands in a while -especially in project form on the open market. Update: I received the numbers from the seller, this is Chassis 1493E07137, Engine 1315*31504. This would indicate this car is not a Confortevole, but a modified 101 bodied Sprint Veloce. Giulietta Sprint Veloce Confortevole. 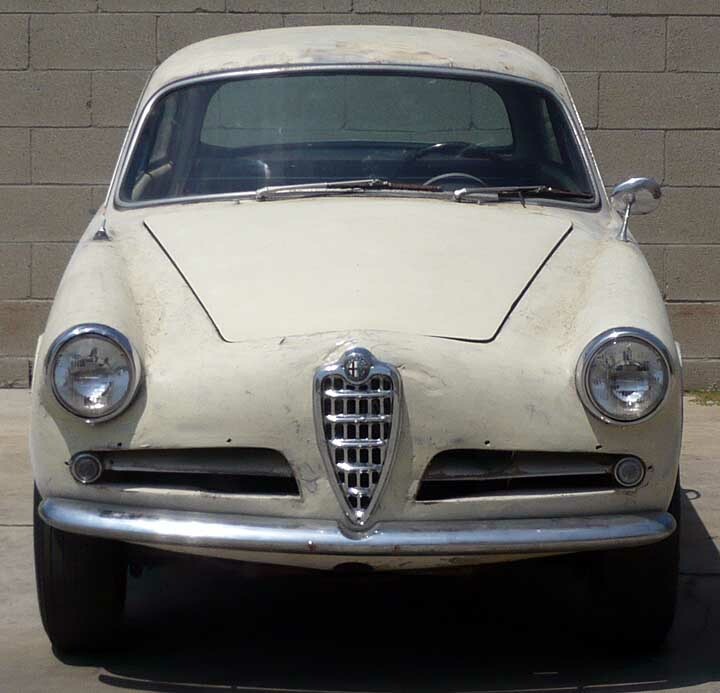 This Giulietta Sprint is available right now on Italian eBay with an opening bid of 30,000 Euro’s or $37,846 at the time of writing… is the dollar approaching parity with the Euro? This car is pretty nice so obviously there is a reserve involved. 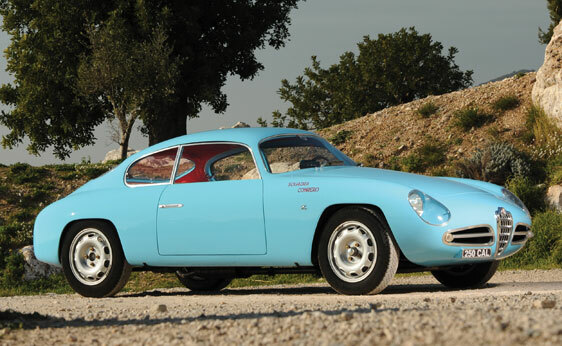 While I’ve got your attention, check out my updates page for pictures of a sweet 1953 Ferrari 212 Inter PF. Body work is gorgeous on this car and the Celeste blue suits it perfectly. Note the laterals in the grill openings have the thin trim strips, an option on ‘regular’ Sprints but standard on the Veloce Confortevole. Sold! $19,340. Deutschland, here it comes. Well, it is eBay, so we wont know until a few weeks pass without it reappearing if it actually sold. I was kind of thinking $20,000 would be the tipping price between a good buy and a good sale, so for what it’s worth I owe myself a t-shirt. Greig, you were the only entrant in my guess the final price contest so I guess I owe you a T-shirt either way. Hopefully I’ll get to them in our life-time. Sprint Veloce ‘Confortevole’ 1493E*06481, engine 1315*30972. I am starting to think that Michael at Fast Cars of California has a endless hoard of Giulietta projects, mainly Sprints. 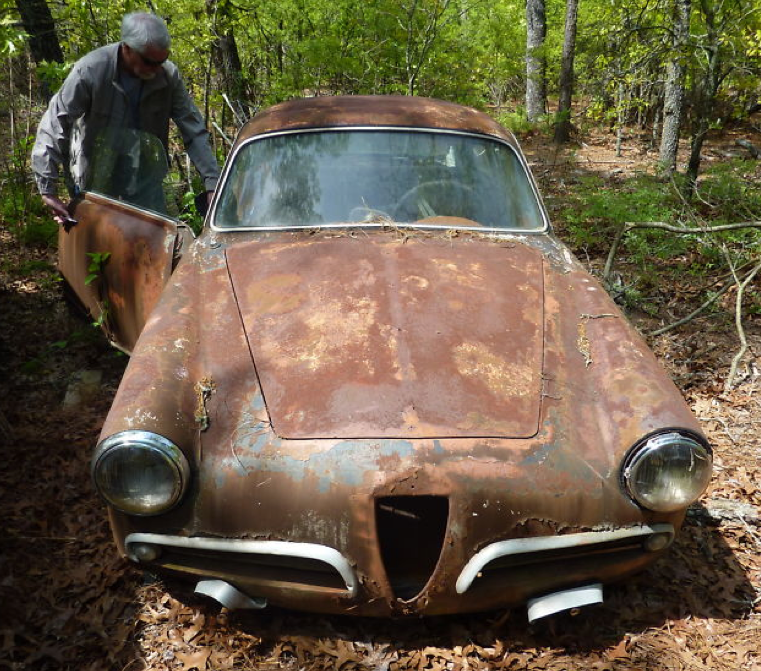 Today’s offering is a 1958 Giulietta Sprint Veloce Confortevole project that apparently spent 15 years with weeds growing through its trunk. The car is complete and basically sound but requires (and deserves) a full restoration. Pretty much all there and ready to come apart. Nose has been where it ought not have been and has lots of little dents to show for the experience. Grill ‘eyebrows’ can be had. SOLD! Ebay auction ended tonight, 5/8/08, for $9500! If all parts are present as the seller states this is not a bad deal, though I was thinking about $7000 was where this would end. I think proper representation with a thoroughly researched and presented parts inventory would have added at least $1000 to the final price. As with any eBay auction, we’ll have to see if the sale is final. 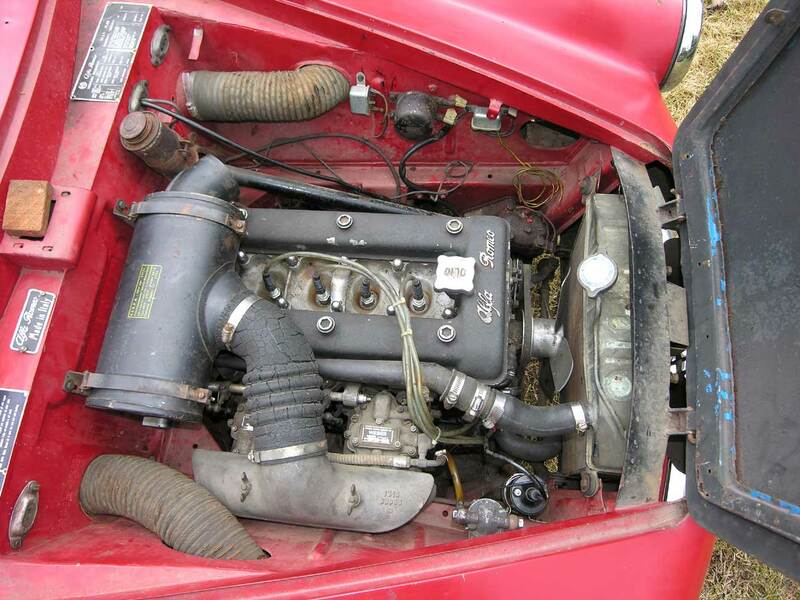 Sprint Veloce ‘Confortevole’ 1493E*06476, engine 1315*30853. Wow is what the seller begins his ebay description with and I have to agree. The production total of the Confortevole (comfortable) variant of the Sprint Veloce (SVC) is 199, the first 50 having aluminum framed windows. An SVC seems to be an SV which falls between the SVAlleggerita (SVA) and the 101 body based SV which began production in early 1958 and upon which 101 mechanical components were gradually phased in until the 750 bits were all used up, sometime in 1960. Alfa factory documentation ends the run of SVC’s at car 06600, but recent pictures of 06611 indicate it is an SVC as well. There is a lot of speculation as to exactly what Confortevole means to the Giulietta Sprint line but I will go with Greig Smiths assertion from a discussion on the Alfa BB that a Bertone body starting with ’65’ and ending with an ‘*A’ is a Confortevole. Any other differences are circumstantial. One thing is certain, the frequently held misconception that a Confortevole is simply a Sprint with a back seat is false. 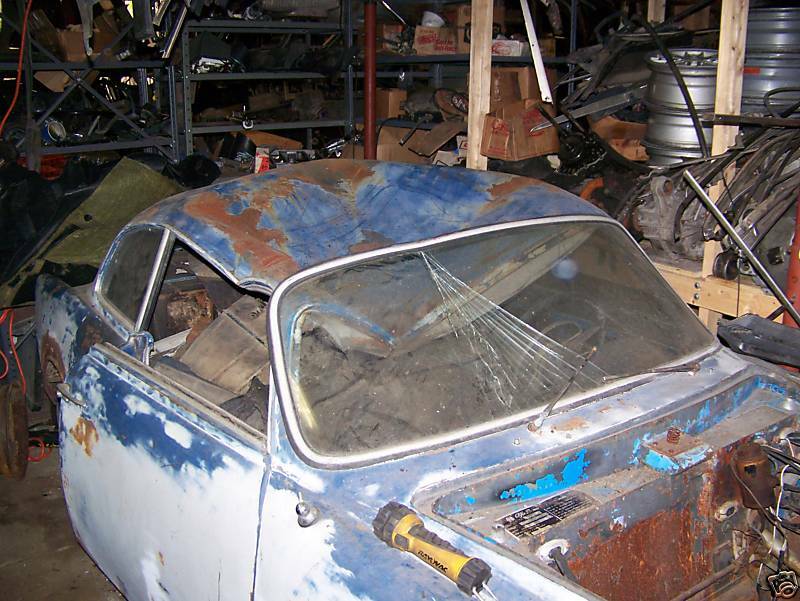 Seller has had the car 30 years and says it was in bad, non-running shape when they got it and despite being stored indoors all those years, which no doubt arrested the spread of the rust, a snow-laden barn did manage to collapse on it. It’s a shame they didn’t start on it sooner when the Veloce specific mechanical parts were cheaper. Not the most encouraging start for your project. At least the collapsing barn spared the windshield trim. An original Bluette car?